The move is largely symbolic, though; there are no active plans to close it. 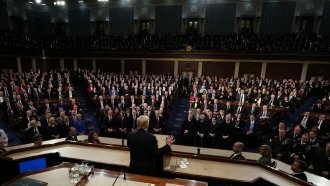 "I just signed, prior to walking in, an order directing Secretary [Jim] Mattis ... to re-examine our military detention policy and to keep open the detention facilities in Guantanamo Bay," President Donald Trump said during his State of the Union address Tuesday. Trump's move to keep Guantanamo Bay open is not unexpected. It is largely symbolic, though. There are no active plans to close it. President Barack Obama tried, and failed, to close the facility, mostly citing wasteful spending. Trump's order on Guantanamo follows through on a campaign promise to keep the facility open and fill it.